I finished this upcycle yesterday for a client. The yellow ruffle at the bottom and the pink collar are from thrifted tee shirts. The rest is knit yardage. Want to see more? 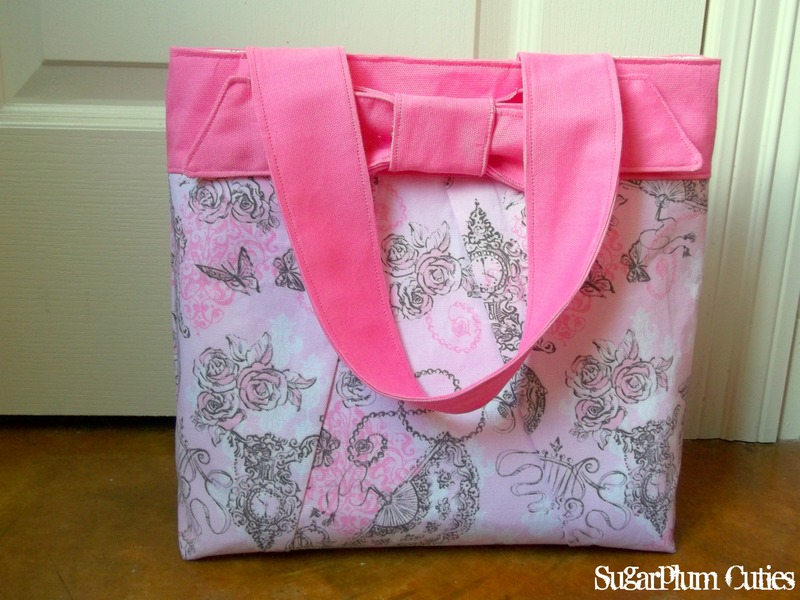 Go Like Sugarplum Cuties on Facebook. 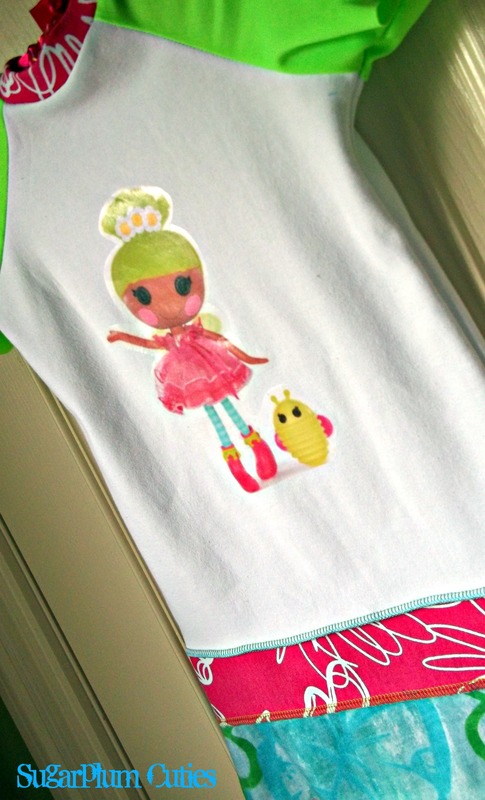 If you have a little girl then I’m pretty sure you’ll know what a La La Loopsy is. They are these little dolls that are kind of a modern take on the old rag doll. My 2 and a half year old daughter and her cousin love them. Actually, love is a gross understatement. Have you seen the new La La Loopsy tshirts? Well, I can’t seem to find them anywhere in this town of ours, and my sister in law hasn’t had any luck either. 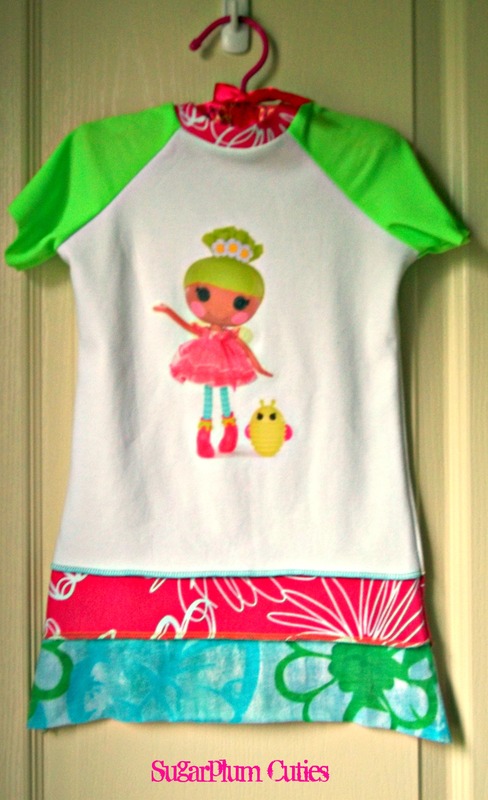 So, I made a dress for the girls with an image of their new favorite Loopsy doll, Pix E Flutters. I added some neon green to the sleeves to match Pix E’s hair and then a couple panels to the bottom as well. A pink neckline completes the look. 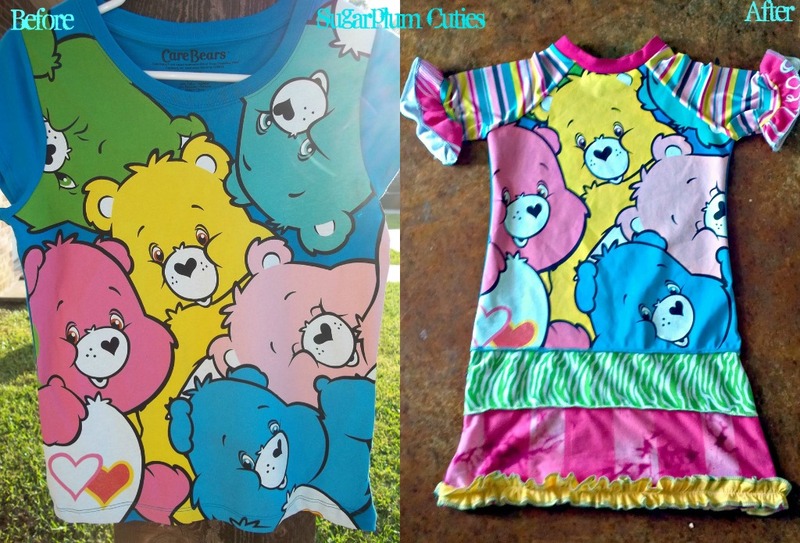 The one pictures is a 2T measuring 19” in length and 12.75” across the chest. You can order one by emailing me or contacting me through my Facebook Page. 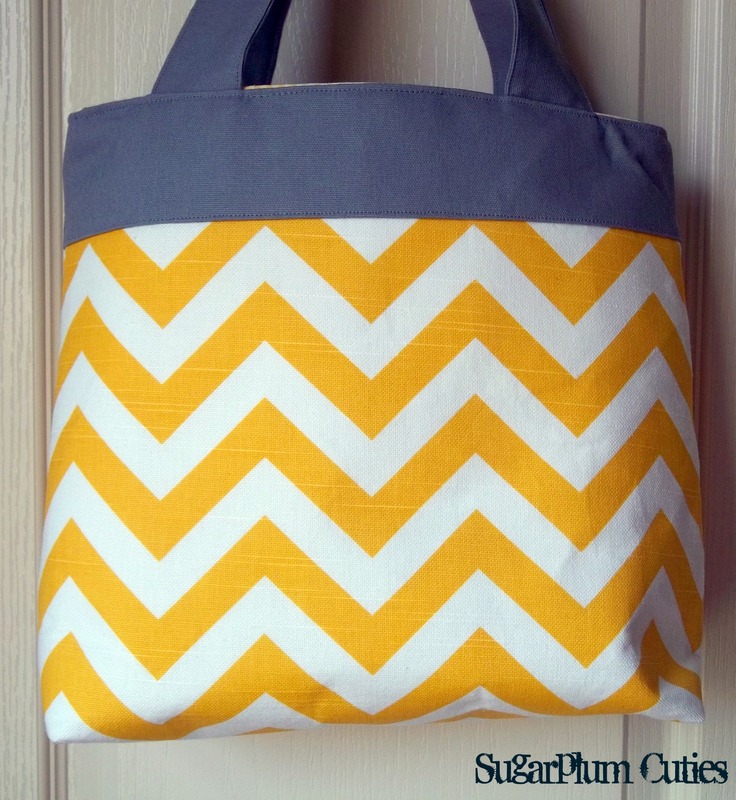 I’d have to say that yellow and gray is one of my favorite color combinations right now. 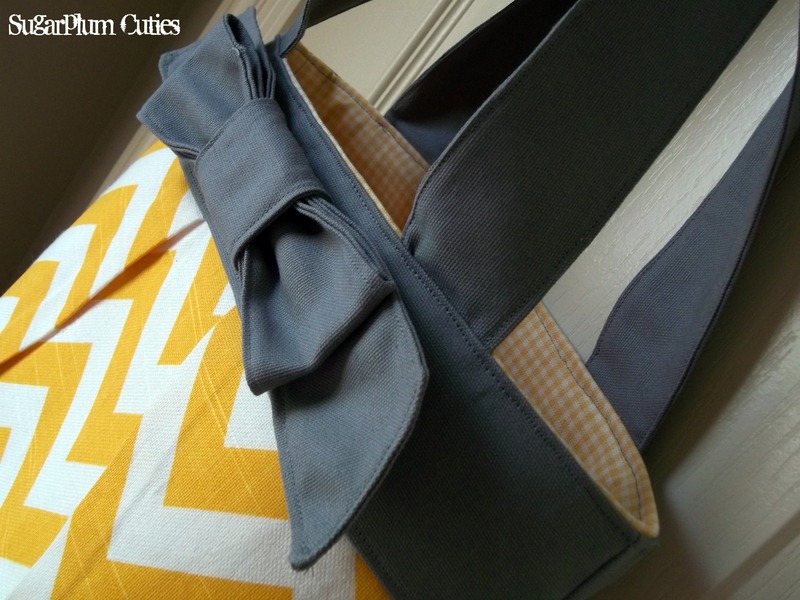 I love that gray goes with everything, and you’ll often see yellow and gray show up in my pictures and in my shop. I went to the fabric store a couple of days ago looking for something inspiring, and I was going through the MOUNDS of bolt on the $5.00 a yard table. I literally had to put my purse down and put up heavy fabrics and put them to the side as I was sorting through the clearance table. Almost at the very bottom was a half yard of a yellow chevron drapery panel. Jackpot. I picked it up knowing it was going to cost me only $2.5 but seriously I would have bought a lot more if there was more left. 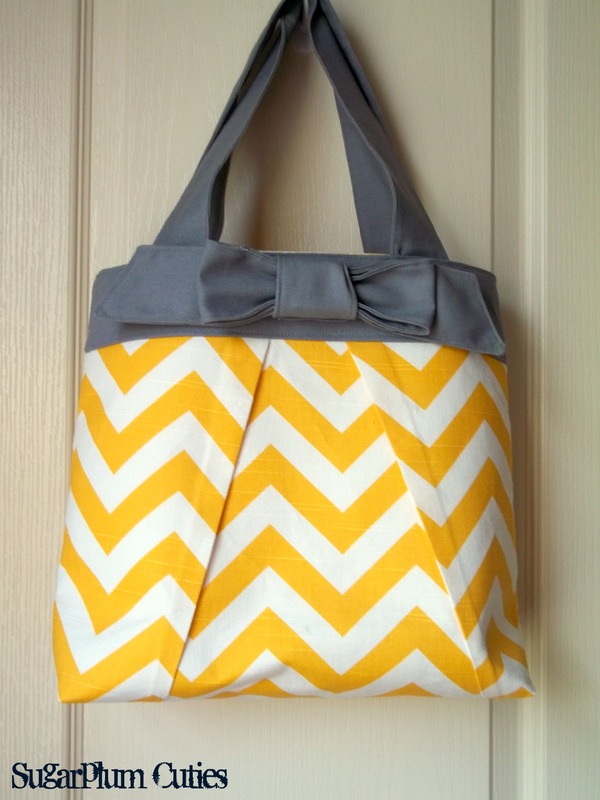 I grabbed some gray to match and made a new purse out of everything. I think it came together great! There are intentional imperfections in the fabric that give it such character, and I’m still debating on selling this one or keeping it for myself. I did find more of this fabric online so I could order more if I wanted to make more but alas it’s $8.48 per yard. Can’t beat that $5.00 price! You can see the inside peeking out of this picture. 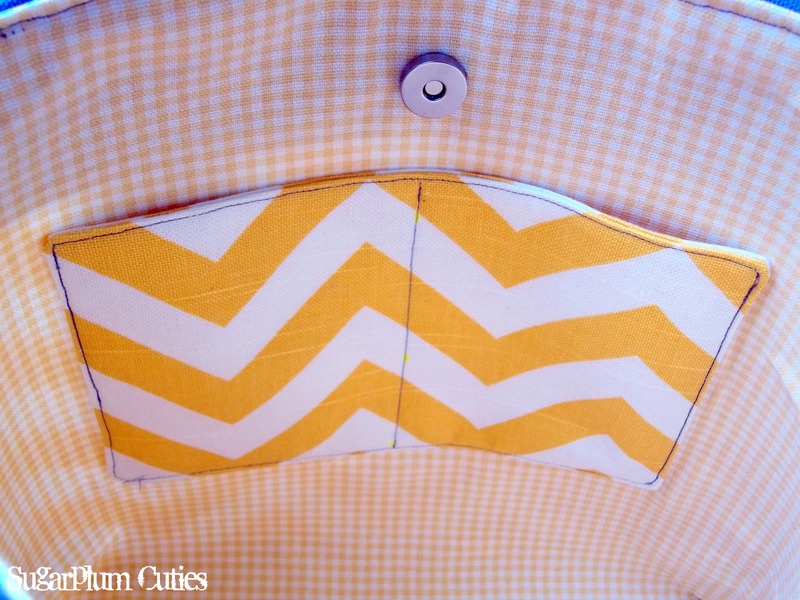 I choose to go with a yellow gingham for the inside. I love mixing prints, and I think the tiny gingham really balances the bold chevron on the outside. Here’s a better view. All in all, I think this one came out pretty cute. 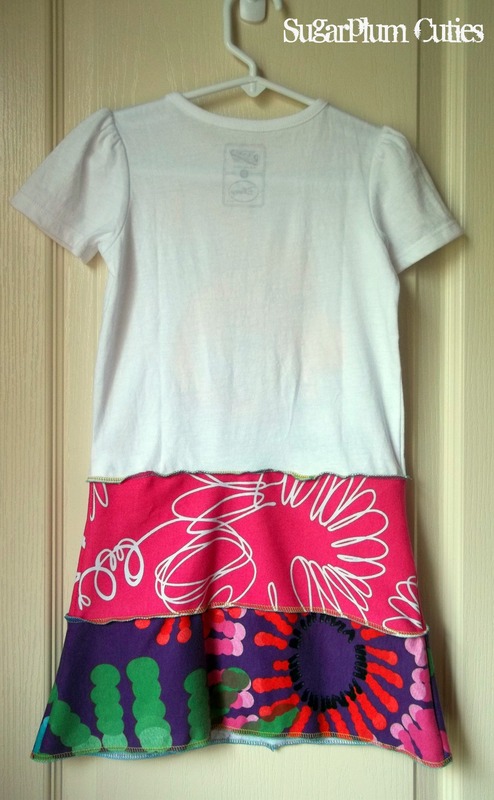 I cut it one night after the kids went to bed and then sewed it up the next day. Devin is away on Coast Guard duty until late Sunday night, so I’m fitting in the sewing time wherever I can. Hope you like it! 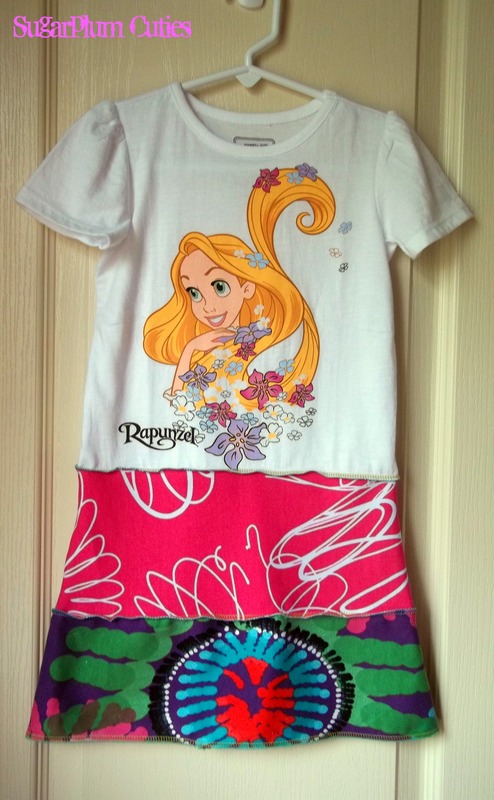 I bought two Rapunzel shirts at Old Navy last weekend when they were having a pretty good sale. One for Rylea and one for her cousin. I figured it’s spring time and Rylea really doesn’t like to wear anything that’s not a dress, so I brought them home and they sat for about 2 days until I figured out what I wanted to do. I cut the bottoms of the shirts off, made 2 pattern pieces and attached some knit yardage to the bottom by serging it on. Super quick, super easy, and I finished both dresses in about 2 hours last night. Here’s a view of the back. I found both of those fabrics in the clearance section at my local fabric store. $2.95 a yard? Yes please. I can’t wait to see those girlies twirling in their new dresses! Contact me if you want some of your own! I just made a new bag for my mother in law for her birthday later this month. I’ve gotten great responses to it so I thought I’d offer them up for sale as a made to order type thing. I’ll be listing a couple ready to ship bags in my Etsy shop in a couple of days as well. 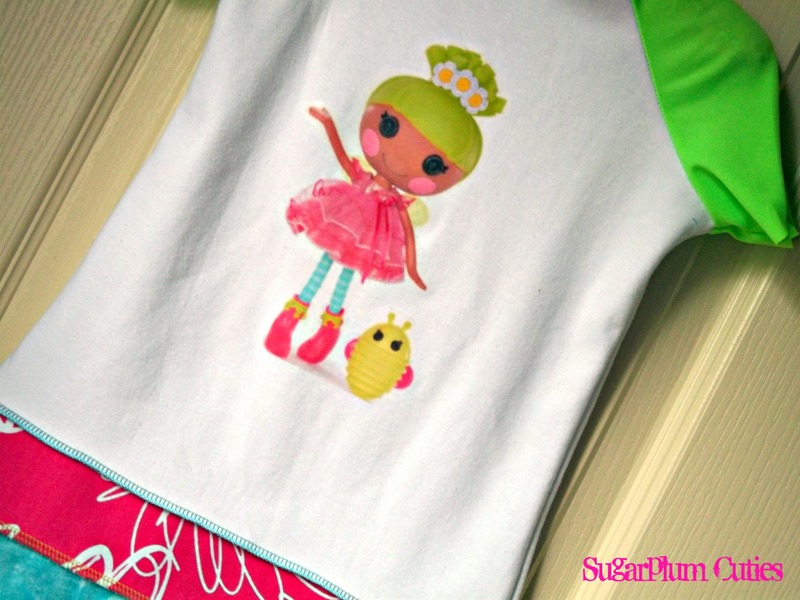 And, as always, don’t forget to head over to Facebook and like Sugarplum Cuties to keep up with all the new stuff for sale. This tote measures about 12” x 12” not including the length of the handles. Made with stain resistant fabrics and is also machine wash and dry friendly should you need to wash it. (I recommend tumble dry on low and then pressing it back into shape if needed). All seams are hidden and finished. 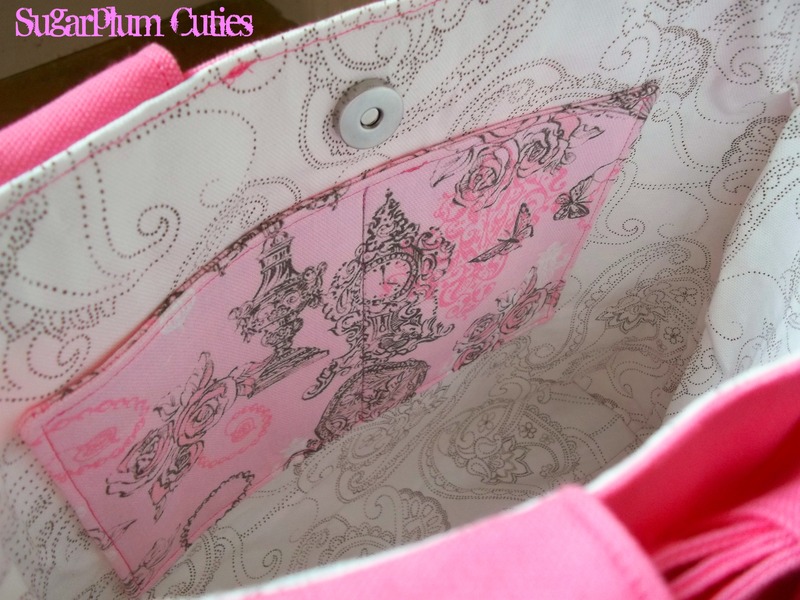 Inside of the bag features a magnetic snap closure and 2 side-by-side interior pockets. Each pocket is big enough to fit a smartphone. Tote has been strengthened with interfacing which makes it a structured bag that will stand up on it’s own and not flop over. Handles have been double stitched for extra durability as well. 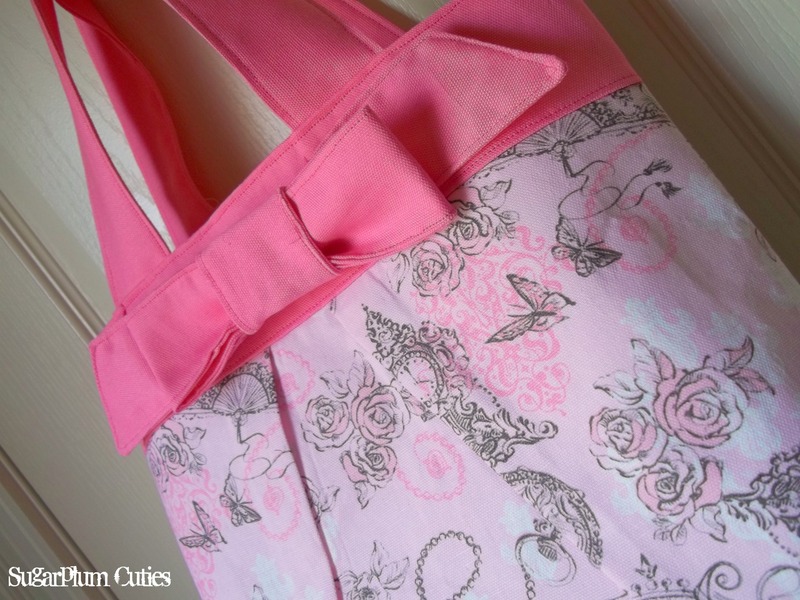 I had a lot of fun making this bag, and Rylea even picked out the fabric. 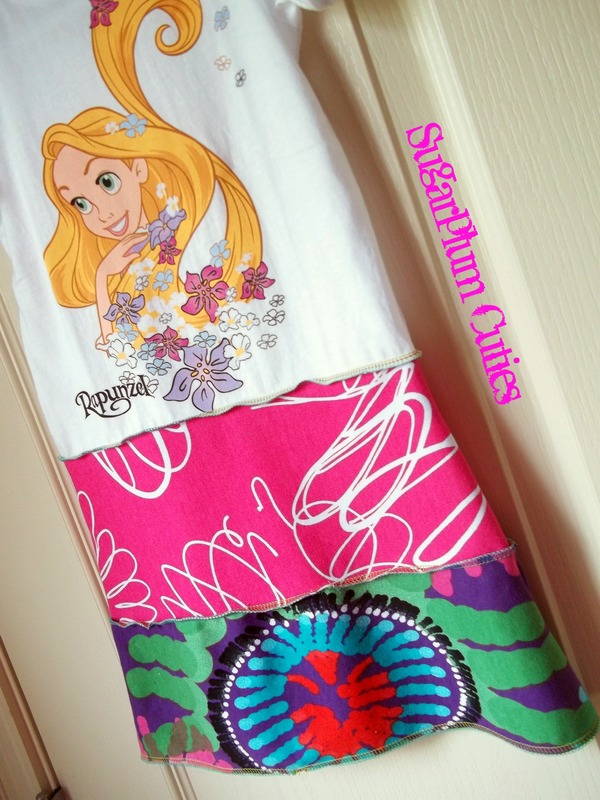 I think my sewing and designing skills are rubbing off a bit! Magnetic snap closure, and 2 side-by-side interior pockets, each big enough for a smart phone. Tote measures 12” x 12”. Machine wash and dry friendly!